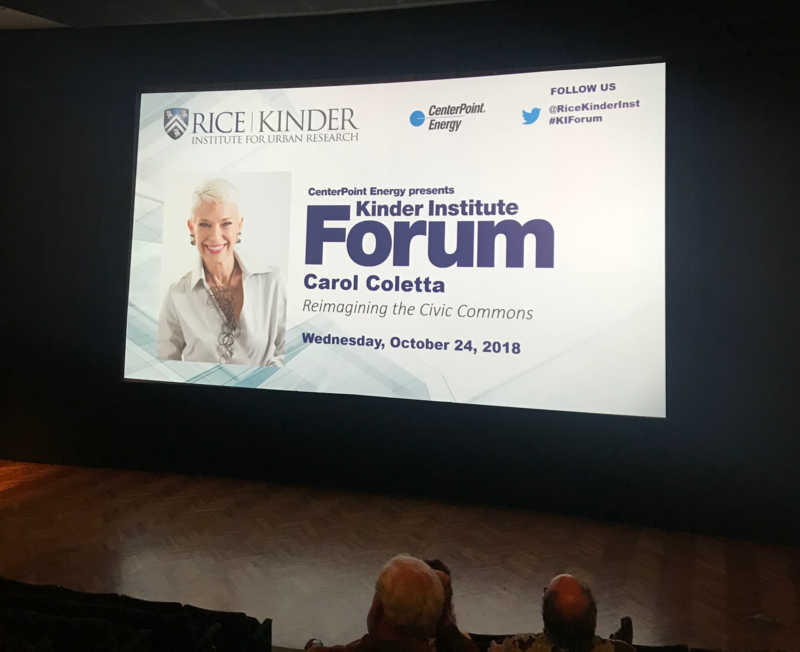 To create a strong, resilient, 21st century city—as Carol Coletta explained in a lecture at the Kinder Institute Forum—it’s important to embrace our Civic Commons, the urban space we share on a daily basis. 2018 certainly brought plenty of changes to the city of Houston. If you are a Houston Heights resident like me, you may have seen my ad and article on the year of changes we experienced in this neighborhood alone—all of which really call now more than ever for a knowledgeable, experienced realtor. Having lived here for over 20 years, I have enjoyed seeing so many of the positive changes, like the dining options that continue to grow and which I add to my ongoing list. There are always going to be the occasional bittersweet turn of events though. As one example, one of my favorite local haunts, Obsidian Theater, is moving from its longtime home at 3522 White Oak to MATCH theater due in large part to the rent increase in their White Oak space. Coletta’s talk led me to ponder what I like so much about White Oak between Yale and Studewood. It is one of the most walkable stretches of the city. On a given Obsidian show night, I could get on the list at Coltivare, see my show, and grab a gelato from Gelazzi afterward. That is such a rare opportunity, and it got me out to see faces I might not otherwise have seen. 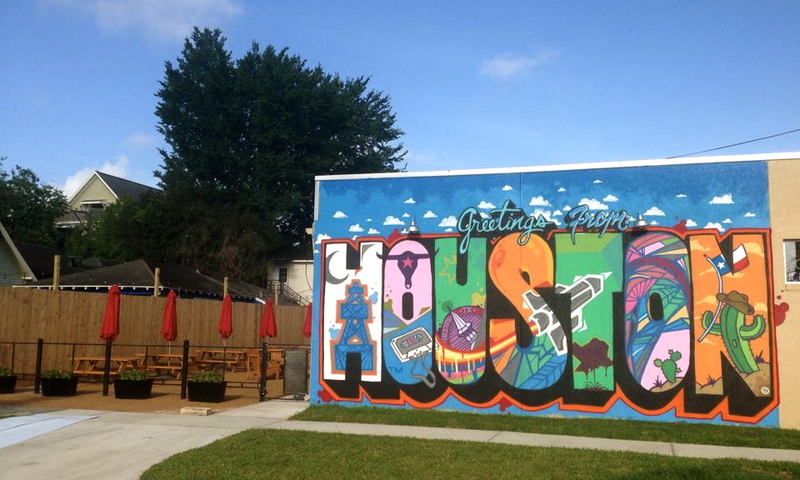 These days, the Heights is not as diverse as some other Houston communities, but I do think there is enormous value to getting out and seeing both your neighbors and your neighborhood’s visitors. Walking down this stretch of White Oak (which, in case you didn’t know, is what 6th Street becomes), you’d also see who is patronizing Better Luck Tomorrow, the wonderfully unique neighborhood bar that happens to have James Beard award-winning cuisine, a more laid-back group at Onion Creek Coffee Shop & Bar, some hungry Houstonians at the taco truck next to mainstay Charlie’s Liquor, those enjoying the Vietnamese influence at Pho Binh, and the younger (dare I say rowdier, sports-minded) crowd at Christian’s Tailgate, just to name a few. This is truly a vibrant slice of the neighborhood. But why is it so important, outside of simply having a great neighborhood? Well, Carol Coletta’s data shows that Houstonians taken as a whole are less trusting than the average American, and if I had to venture a guess as to why, I would say because of our sheer size. While we certainly aren’t the biggest city population-wise, when you couple our population with our sprawl across not only our 600-something square miles of Houston proper, but the surrounding metro area as well, it genuinely is hard to recapture some sense of shared identity about who is/what makes a Houstonian. 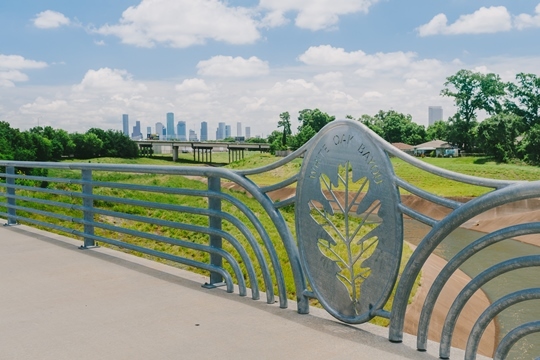 This isn’t just a Houston problem, as Coletta points out, “The number of people who agree with the statement that ‘you can trust most people in america’ has dropped from the majority to about 1/3.” That is why I think these public spaces are so important. While retail and restaurants are wonderful forms of public space (which reminds me of another factoid Coletta mentioned: 2017 was the 1st year out of home food consumption exceeded in home food consumption. Wow! ), they do tend to keep us separated along class lines. Today, over 1/3 of people live in either an “all rich” or “all poor” neighborhood and the number of people who live in neighborhoods where at least 40% are poor has doubled since 2000. World cities, cities for tomorrow, and economic powerhouses can’t truly thrive as long as we are separated between the haves and have nots (look out for my next blog post where Mayor Sylvester Turner talks about just that). After all, Detroit used to be Silicon Valley, but without socioeconomic diversity it was found in terrible blight after major destruction. Strong cities must be resilient cities. The 21st century city must be developed in a way that compels us to feel our neighbors because it will be built with trust, empathy and equity. Because without feeling there isn’t connection. How can I help you get more connected in 2019? Buying or selling a home or just want to know more about the Civic Commons? Give me a call at 713.829.3052 or email me at cynthia@cynthiamullins.com.